The records that Geoff Love made are usually a subject of discussion among the record collecting friends that I know. I cannot say I like all of them (both the records that Geoff Love made and these record collecting friends), but there are at least five that I cherish. But I know that some of the readers of this blog hate the sound of Geoff Love. Some of the Geoff Love records are easy to find, others are not, although none of these LPs is probably a collector’s item. 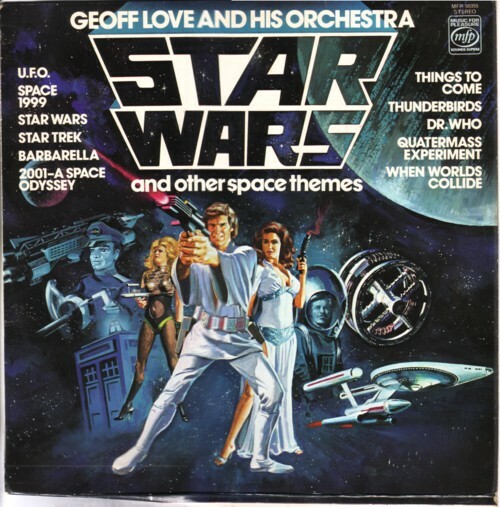 In the plastic bag that Dirk Koorn gave me was a copy of the ”Star Wars and other space themes” LP. I think that in the disco versions of the Geoff Love Orchestra some of the tunes are even better than the original versions.